The trackers mustered at Tex Canyon Road, 20 miles north of the Mexican border, on the afternoon of March 27. There were border-patrol agents, six search-and-rescue units from the Cochise County sheriff's department and dogs trained to track escaped inmates from nearby Douglas State Prison. Several ranchers were also there, many of them descendants of the Germans and Irish who came to the San Bernardino Valley a hundred years or more ago. Back then, the ranchers settled here in part to feed the U.S. troops stationed at the border. One military mission in those days: prevent the chaos of the Mexican Revolution from spilling into the Territory of Arizona. Now another period of powerful unrest in Mexico had brought a different kind of war to the valley, and the ranchers were mindful that the violence might have claimed one of their own, a man named Rob Krentz. When Krentz's daughter Kyle heard that her father was missing, her first thought was, How do you lose a guy that big? Krentz, 58, was a bear of a man--when he played football in high school, his nickname was Captain Crunch--but throughout southeastern Arizona, those who knew Krentz say his heart was the biggest thing about him. The trackers couldn't find Krentz before nightfall, so they waited for a border-patrol helicopter, which spotted his ATV 10 miles from his house just before midnight. It was hidden in the trough of a swale, its running lights still on. The helicopter's thermal imager showed the heat signature of his slain dog, according to a relative of Krentz's. Beside the dog was Krentz himself, his body too cold, dead too long to register a thermal reading. News of Krentz's murder spread quickly through the valley and then to the rest of the country. In an era supposedly defined by outrage at Big Government, the questions of what to do about the border and the estimated 12 million undocumented workers who are living in the U.S. during a recession have inverted the usual political equations. Conservatives are clamoring for federal troops and for police to be granted broad new powers that many officers didn't even ask for. President Obama irritated many in his party by planning to send up to 1,200 National Guard troops to the border (although, as under President George W. Bush, the troops would neither be armed nor authorized to detain suspected illegals). Arizona, long trampled by the millions passing through to the north, has become a laboratory for competing impulses, pitting security against civil liberties with an abandon that surprises much of the rest of the country. And even though SB1070, Arizona's tough new law cracking down on illegal immigrants, was introduced long before Krentz's killing, he has become the face of the issue. There was once talk of naming SB1070--which requires local and state police to ask for immigration papers from anyone suspected of being in the country illegally  the Rob Krentz law. When a Pinal County sheriff's deputy was wounded by suspected drug smugglers on April 27, Krentz's murder was invoked: This is now a trend. We need action. It's easy to forget, then, that before Krentz's murder was a political talking point, it was a personal tragedy. Standing in front of the Krentzes' ranch home on a weekday in April, his widow Sue offered bottles of Coors Light and cranked up the car radio to listen to the song they played at his wake: "Standing Deer's Lament" by Brenn Hill. If you want to know Rob, she told me, then listen to the words of that song: "If he believed in hatred, we would not be friends ... Mi compadre, buenas noches. Good night, my old friend." She started to weep and then stopped herself. "Rob wouldn't want me to be a wimp," she said, "even though I feel like setting my hair on fire." She said she hopes her husband's death will get people to support two things: the Ronald McDonald House ("They only charge $15 a night if you have nowhere else to go. It's wonderful") and the Arizona Cattle Growers' Association's 18-point border-security plan, which calls for more troops, better equipment and tougher laws to punish those caught crossing illegally. SB1070 isn't the first law Krentz and the cattle growers would have chosen to support, but their general consensus is that it's better than nothing. It is still unclear, however, who killed Krentz. The trackers followed a set of footprints south, toward the border, but on May 3, the Arizona Daily Star reported that "high-ranking government officials" said the killing was "not random" and authorities were focusing on a suspect who, whatever his nationality, was in the U.S., not Mexico. A top state law-enforcement official likewise told me, "Don't assume the killer went into Mexico." See pictures of Mexico City's police fighting crime. 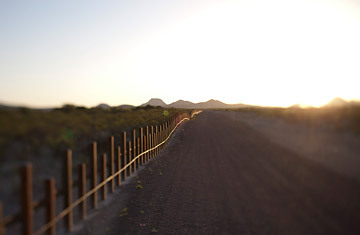 See pictures of the fence between the United States and Mexico.